Want to try exploring the miniature worlds accessible through close-up photography? There are options for every budget, from premium lenses specially designed for macro work, to relatively inexpensive extension tubes and close-up lenses, or “diopters”, that resemble optical filters and attach to the front of your lens. Here are the basics to know about each option. A true macro lens can focus close enough to produce a 1:1 (life-size) magnification at the image plane (whether film or digital), meaning that if the subject—say, a coin—is one inch in diameter, at 1:1 magnification, it will be one inch in diameter at the image plane. Thus, with larger-sensor cameras, the subject will take up a smaller part of the frame than with smaller-sensor cameras, but the subject itself will always be life-size. Macro lenses are optimized for close shooting distances, but that doesn’t mean they’re not useful for other types of photography, too. 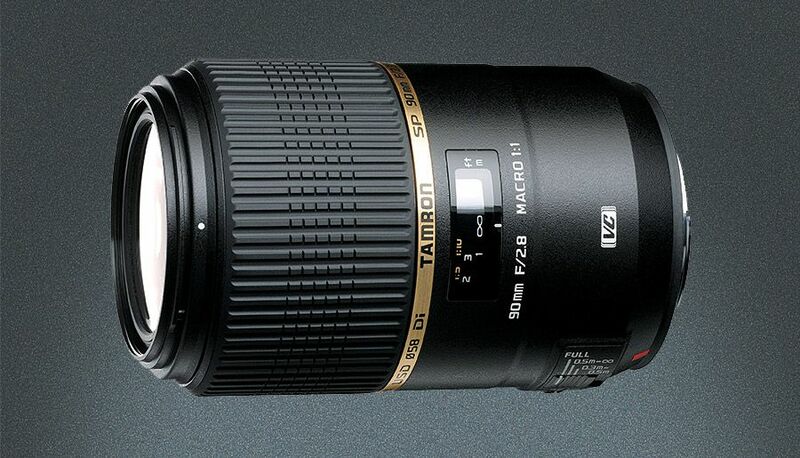 For example, the Tamron SP 90mm ƒ/2.8 Di VC USD 1:1 is an ideal focal length for portraits, in addition to being a versatile macro focal length. Macro lenses come in several focal-length ranges: “normal” (50mm or so on a full-frame camera), “short tele” (100mm or so) and “telephoto” (180-200mm). Though all will focus down to 1:1, the main benefit of longer lenses is that they do it from farther away, giving you more space between camera and subject, and more room to position your lighting. 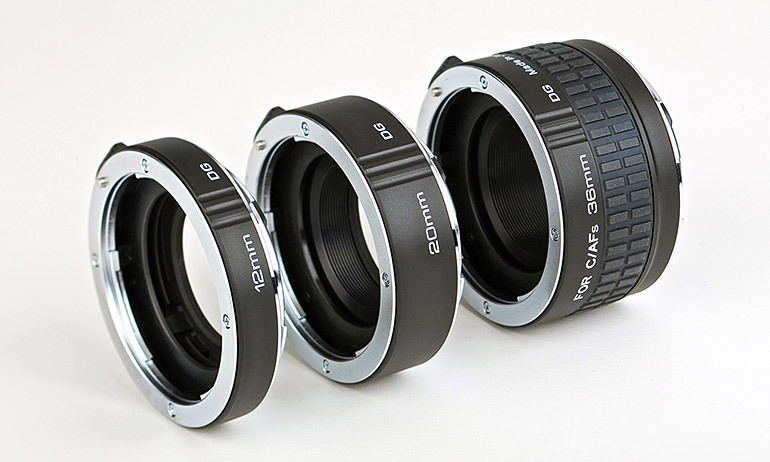 Kenko Teleplus DG Auto Extension Tube Set for Canon, Nikon and Sony Alpha (A) mounts. You can also obtain 1:1 (and greater) magnification using extension tubes. These are essentially light-tight spacers that mount between camera body and lens. The resulting extension means the lens can focus much closer than it normally would, but note that the lens cannot focus out to infinity with the extension tube attached. Extension tubes cost much less than macro lenses, and work with any lens. When the length of the extension tube equals the focal length of the lens, the resulting magnification is 1:1. If the tube is longer than the lens focal length, the magnification increases. The main drawback is that they “eat light”—at 1:1 magnification, an extension tube costs you two stops of light. Canon’s double-element 500D is a premium close-up lens, and is designed for use with lenses of focal lengths from 70mm to 300mm. If you want to experiment with close-up photography but aren’t ready to invest in a true macro lens, these screw-in lenses, which look a lot like an optical filter, are the least expensive alternative. Remember, though, that whenever you attach any optical element or filter to your lens, you’re potentially degrading image quality. Inexpensive lenses may also produce large areas of blur when shooting at fast apertures, so you’ll get better results when stopped down to apertures around ƒ/16 or smaller. 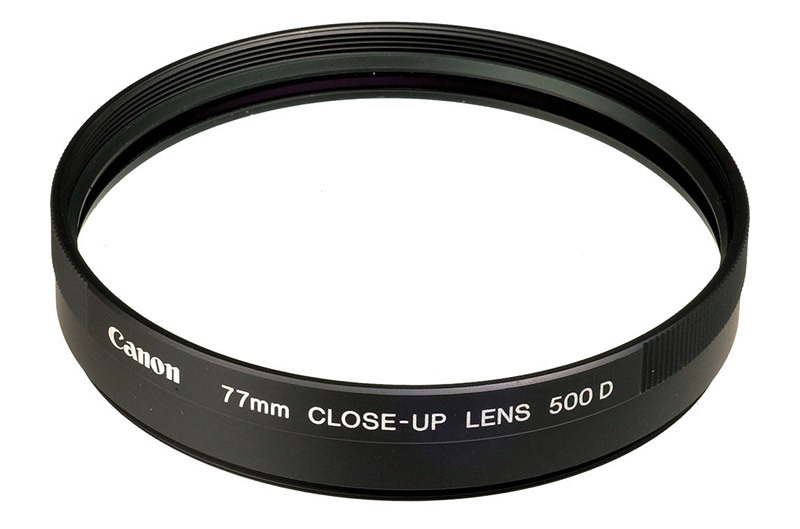 There are two types of close-up lens filters: single element and double element. The single-element design is less expensive, but also more prone to loss of sharpness and color infidelity. In a double-element design, the second element is used to correct the aberrations of the first element, producing better image quality, but also making these considerably more expensive than the single-element variety.